Luc Besson's grandiose sci-fi 'Valerian and the City of a Thousand Planets' opens with David Bowie's celebrated song 'Space Oddity', playing over a montage which captures humans welcoming various extra-terrestrial species, interacting with them for the first time, who respond in their own eccentric ways. It's puzzling later that a movie which began this way dedicated most of its resources to the exasperating run-of-the-mill events while the interesting bits were done away cheaply with just some superficial visual touch-up. Had the movie been about those less-loved pieces, it could have been so much more--even a breakthrough film in its theme. What we get in the end is another visual gimmick, deprived of all the curious possibilities which necessarily would have translated to a fresh and ingenious attempt. I am seeing a pattern here, Morten Tyldum's Passengers, another high-budget mainstream film that too suffered with the same disease which plagues Valerian. Why do films these days apparently have original ideas but their treatment is utterly, unabashedly unoriginal? Have the tropes and cliché's become 'indispensable' to movies with high commercial viability? As far as the film's conflicts are concerned, there is literally not even a single penny of original thought. The story is based on the French sci-fi comic-book series Valérian and Laureline, a highly successful one, also making an influence on Star Wars. Dane DeHaan is Valerian, Cara Delevingne is Laureline, who are a team of special operatives, who go on missions to maintain order in territories inhabited by Humans. Herbie Hancock, the unnamed Defence Minister, who sends them on a mission to the metropolis of Alpha--the City of a Thousand Planets, where extra-terrestrial forms of life have converged to live together, sharing their knowledge, intelligence and culture. It is divided into four corners--South, the underwater world, inhabited by peacefully living marine life; the North inhabited by ultra-sensitive species capable of engineering new cells; the East, obviously inhabited by species specializing in Science & IT; and finally the West, the crowded cultural capital. Now that Maj. Valerian and Sgt. Laureline are endowed with responsibility to protect Alpha, and the universe at stake, the film spends most of the time on couple being in pursuit of themselves. Though it helps to establish their (phoney) relationship, which was cute but not suffice at expense of the larger plot. Also noticeable was the way humans were projected to behave and interact in 28th century. The civilization was painted futuristic only by their progress in science-technology, while socially and culturally they could even pass for 20th century folks. It's a topic for debate whether the fundamental nature of humans have changed or remained the same since the birth of civilization, but following the movie's logic, we can conclude that Luc Besson doesn't at all believe in thechanging dynamics of social interaction. When Laureline was in quest of Valerian, she encounters a triplet of odd looking alien creatures who resemble Dobby from Harry Potter series. They know the city of Alpha very well, and exchange that information for money. Each contains 1/3th of the info, so they get along by staying together. In their cameo they came across as likeable and a little selfish, which made sense. 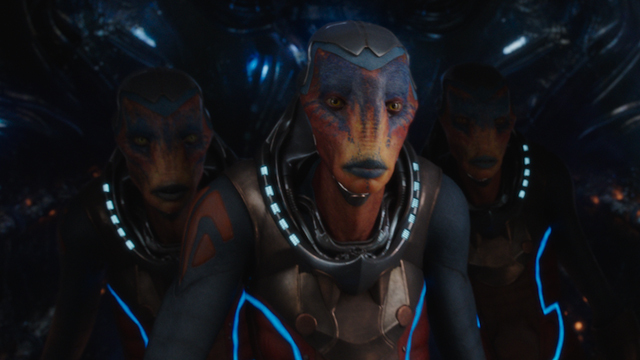 Valerian encounters Jolly, perhaps the hottest pimp since Gary Oldman as Drexl in True Romance. Ethan Hawke is a swanky dressed hip-pimp, exudes swagger and an ardent advocator of the kind of love he trades. Then Rihanna as Bubble takes charge, who looked as gorgeous as ever. Bubble's outstanding feature is that she can transform her form to that of any being. She is an entertainer, who performs for Valerian who swoons with admiration by her bewitching dance performance. Bubble gives happiness to everyone but her own life is a tragedy which has overtaken her zeal for life. There is also a Planet Mül, which once had a sophisticated civilization, vanished during an intense war between humans and another intelligent species. Clive Owen, playing the commander, ordered his subordinates, against their protest, to launch the weapon, calling the inhabitants 'savages', reasoning that he protected the interests of his 'own people'. Those who managed to escape the calamity, found shelter in Alpha, lived surreptitiously and learned 'languages, mathematics, physics, chemistry and technology'. All they needed was a 'converter', a rare animal which shelled out precious Pearls containing boundless energy. Yet again, we are proved that visual imagination and interesting ideas alone do not necessarily translate into a film as great as it 'looks' when the plot is forcefully superimposed onto the overused formula. 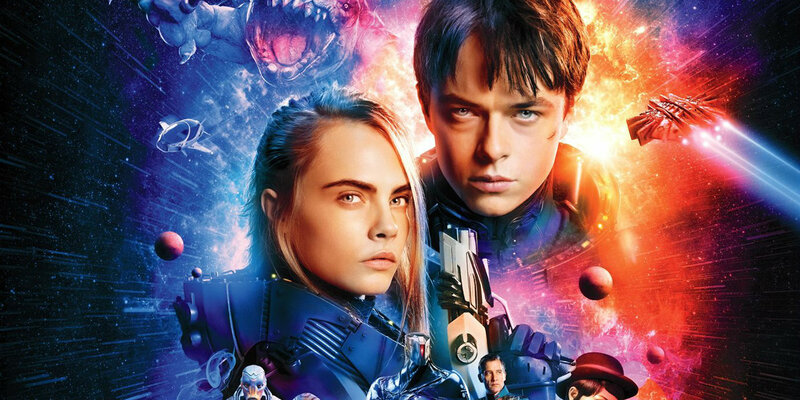 However, fans of 3D-films, kids and teenagers are going to love Valerian and adults too will enjoy the film if they keep their expectations low, approaching it just as a stress-free visual entertainer.